Out of nowhere I get an email from a collector in Spain who happens to be the son of a man who bought the below piece from me back in the 1980s. He wanted confirmation that this was indeed my work, as it is being offered for auction in the near future. "Frida with Cuba" was done by me in 1978 as part of a freshman or sophomore painting class at the University of Washington School of Art, which I attended courtesy of a scholarship from 1977-1981. It was part of my infatuation with the Kahlomeister, who back in the late 70s was essentially still known as Diego Rivera's wife. 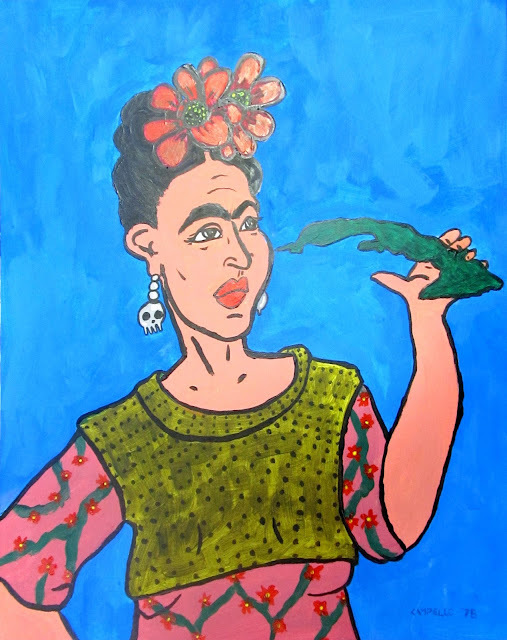 I suspect that at the time, most of my UDub art professors (Jacob Lawrence, Alden Mason, Norm Lundin, Frances Calentano, and others) had no idea who Kahlo was, much less why I painted her (sort of comic book style) holding the island of Cuba. I sold this painting at the Pike Place Market, where from 1978-1981 I sold almost every single art school assignment ever finished by me... once it was graded - it was up for sale... This piece probably went for around $25 at the time. Kahlo (unfortunately) like most of the intelligentsia of her times, was a naive Communist, sort of a champagne Communist if you will, and even though she died several years before the Castro brothers began to brutalize Cuba under the yoke of Communism, I suspect that had she lived to an older age, she would have been a fan of the Castro's oppressive regime, and thus my painting. Everything is closed in the DMV because of wind... I almost started to make fun of that and then I opened my front door! And then I went to the backyard and the trees were doing this!